During the development of osteomyelitis x-ray examination is performed in order to establish a definitive diagnosis and to clarify the prevalence of the pathological process and to monitor the dynamics of the disease. In the picture, made in the early stages of the disease, cannot be localized intermuscular fascial septa that are visible in normal healthy people. In pathological process blurs the line between muscle structure and subcutaneous tissue also increases saturation, and the volume of soft tissue structures. 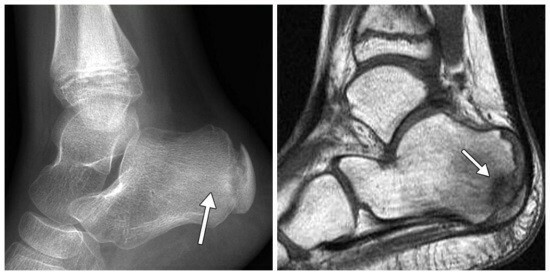 X-ray diagnosis of osteomyelitis is a key technique, but in the case of infiltration of the inflammatory process affected the soft tissue, namely muscle, tendon or fat structure, x-ray is not informative. However, the medical literature describes cases when the inflammatory process in the soft tissues was diagnosed in an x-ray with reduced stiffness of the beams. You must also remember that the diagnosis of chronic osteomyelitis should include not only x-rays but a CT scan for a more complete clinical picture. Imaging is especially recommended in case of defeat of the major bones and joints in the pelvis or spine. To identify signs of their presence using x-ray, you need to have a great experience. 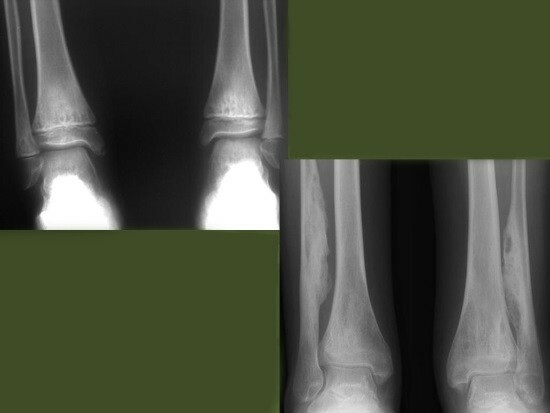 Often used repeated x-rays or the use of the imager. The bone is distinctly thickened in places of development of the inflammatory process. 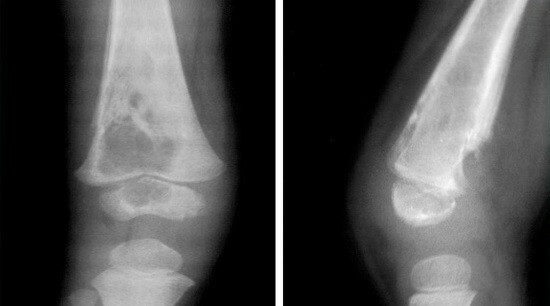 On radiographs noticeable sequesters — lesions in which there is necrosis of the bone or muscle structure. They look at the x-ray photograph as dark circles on ivory, or light on the soft tissues, having the wrong form. On the radiograph osteomyelitis is impossible to detect the medullar canal. Modern x-ray allows the use of the method of the direct increase x-ray image. This method allows to analyze small foci of necrosis and cavity, which is localized chronic inflammation. However, when the inflammatory process has gone too far and formed a pronounced sclerosis of the bone, and appeared intraosseous regenerates, x-ray does not give a spatial representation of bone structure and intraosseous channels. In such cases, the patient is assigned to fistulography. 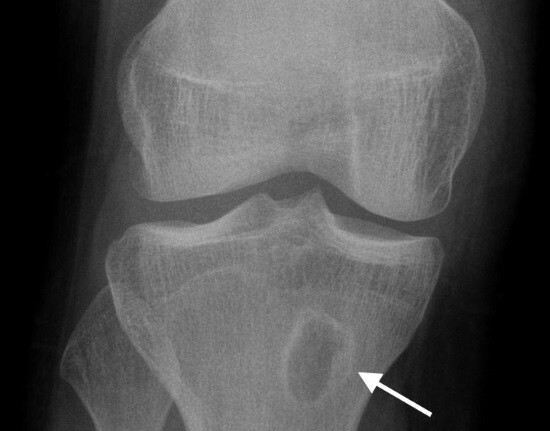 During the development of chronic hematogenous osteomyelitis any further signs from the bone marrow and periosteum, on the x-ray revealed focal is a lucid and signs of reactive osteoporosis. On the background of the development of this process, x-ray image appear dimmer and the shadow of the sequesters, which are sometimes with difficulty detected. The medullar canal is completely or partially replaced by the spongy substance of the bone. The periosteum becomes noticeably thinner. On the x-ray there are additional areas of enlightenment. In the case that affects the bone structure of the pelvis x-rays were observed dissociation of the periosteum the type of sponge that sequesters in the pelvis are rare. A similar pattern is emerging with the defeat of the blade. With the defeat of the vertebrae in the initial stages, the reduction in the gap between the vertebrae. Radiological diagnosis of osteomyelitis is the most available and informative diagnostic method for this disease. Radiograph – what is it?